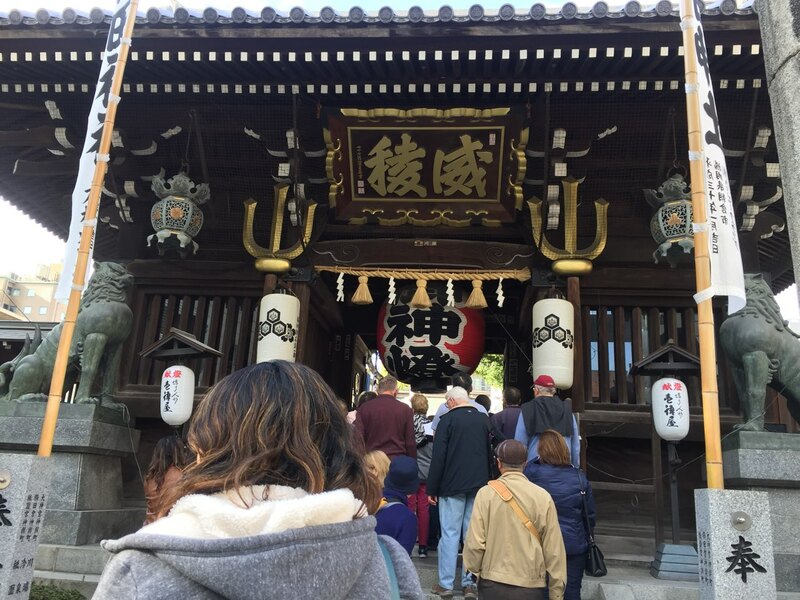 In case you haven’t been following our IG (you should—it’s @nolisoli.ph and we post a lot of food), Nolisoli went on a cruise (our ship was the Royal Caribbean Cruise’s Quantum of the Seas) last week to visit two Japanese cities in the Kyushu province: Fukuoka and Nagasaki. We all know about Japan’s big metropolitan cities like Tokyo and Osaka (the former consistently tops Condé Nast’s best cities in the world lists, with the latter also making frequent appearances), but what about the Japanese countryside? As our visits to places off the beaten track of Metro Manila might have clued you in to, there’s so much culture and history that hides in a province. This is true for pretty much anywhere in the globe. In 1979, while tracing the world’s social and economic history in his book The Perspective of the World, French historian Fernand Braudel wrote, “[was] the province not its inhabitants’ true ‘fatherland’?” He meant this in the political sense, but it works culturally too. A province imparts so much culture that second-and third-generation Manileños are still likely to claim their parent’s hometown as their own. These were both taken at the strolling garden of Fukuoka’s Ohori Park. 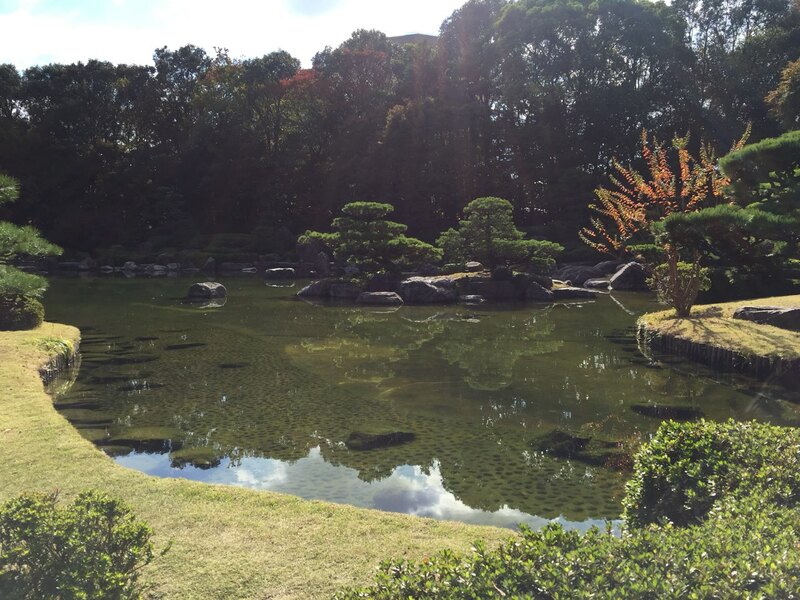 It’s such a pretty sight that Japan has the park registered as a “place of scenic beauty,” a designation given to areas with such aesthetic value that the government gives it special cultural protection. 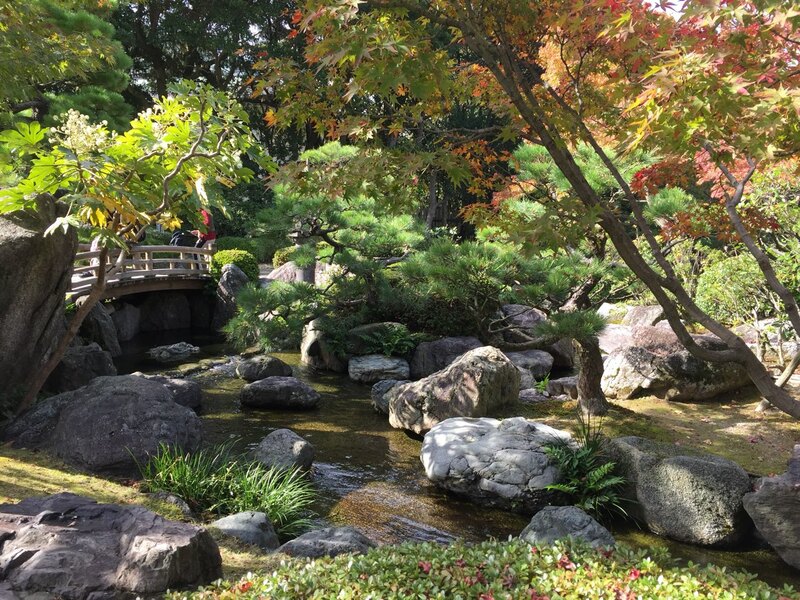 It makes sense: the garden is the epitome of a traditional Japanese garden, its Zen design aimed at letting visitors freely contemplate and find peace as they stroll around the garden’s curved edges. Many newlyweds use the garden as a backdrop for their traditional wedding photos, and we saw a few couples decked out in formal kimonos walking around the park for this very reason. Seeing this, you’d probably assume that Fukuoka is a deeply traditional city. You’re not that far off the mark. 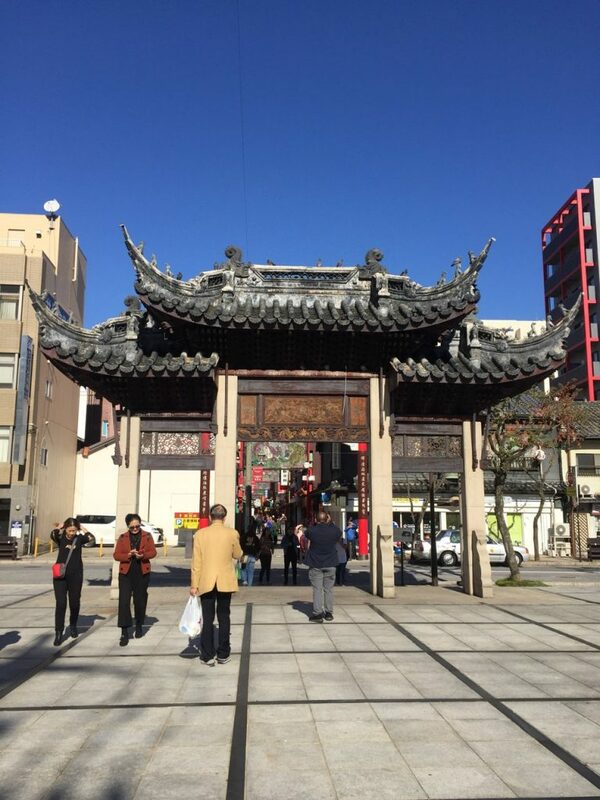 It’s very much a modern city in its own right—with shopping centers and business districts—but it still keeps its Shinto and Buddhist spirit alive. 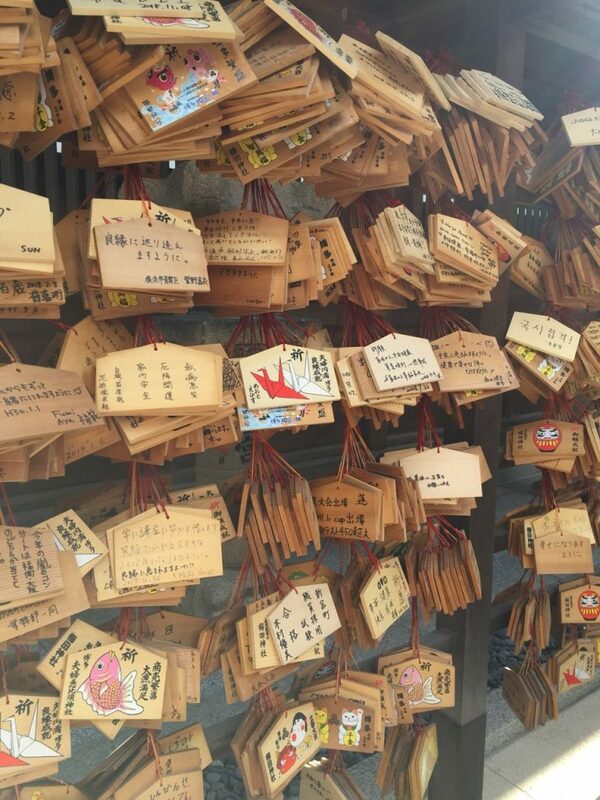 Its shrines and temples are still a big part of Fukuoka life. 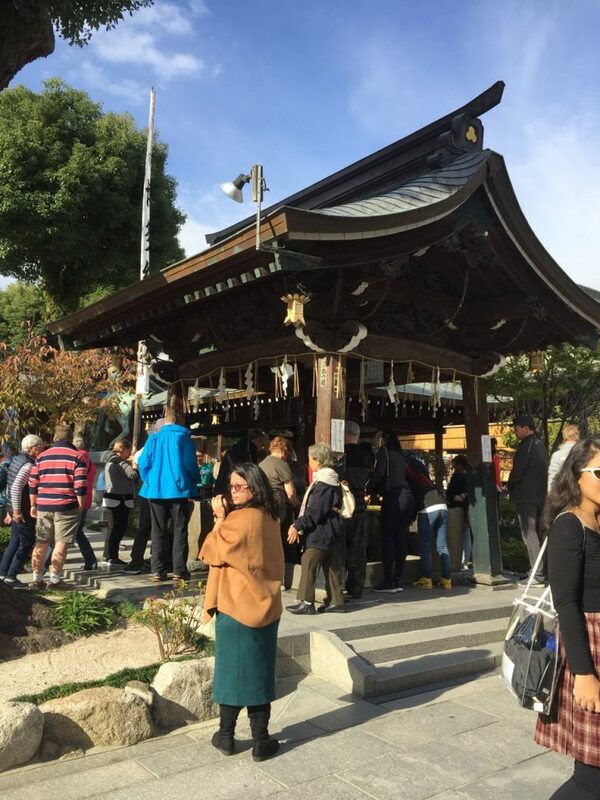 We visited the Kushida shrine, a Shinto shrine situated in the heart of Fukuoka. Quick history lesson: It was originally erected in 757, under the rule of Emperor Koken. Fukuoka is a port city on the northern coast of Japan, and it’s situated near many of the powerful areas in Japanese history. 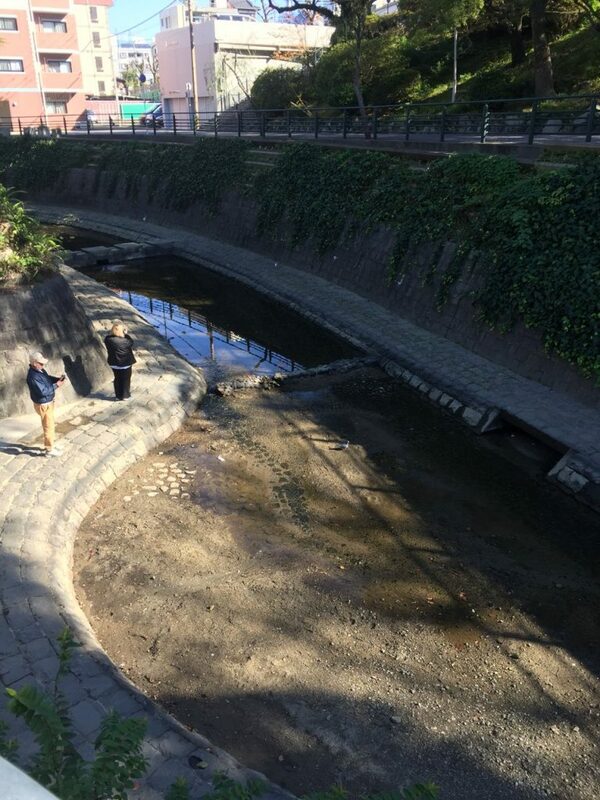 The city’s strategic location meant that it was a key port for many battles among the Japanese noblemen vying for the shogunate. In one such battle, the shrine had been burnt down, and it was reconstructed as the present shrine in 1587. 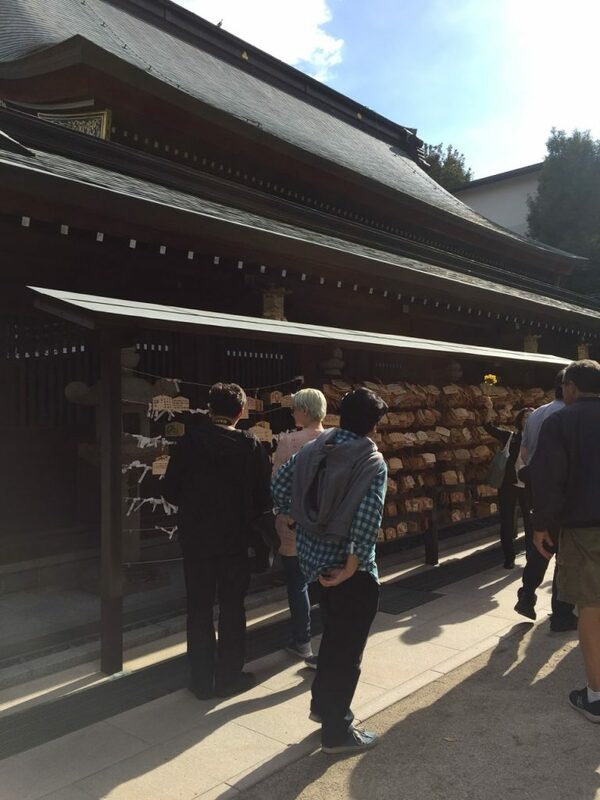 Inside the shrine, it’s hard not to marvel at Japanese culture. Many of our own cultural heritage places need to have their own “gig” to be kept alive, and are always under threat of demolition, but that’s not the case with Japan. Shrines and temples like these are still very well taken care of, and they’re not dead, so to speak. Locals still visit them as places of worship, or at least, for spiritual contemplation. They’re not just tourist traps, places where foreigners and otherwise non-locals visit once just so they say they can. So yes, very different from how we treat our own culturally-significant sites. One thing that might sound familiar, though, is Japan’s festivals. Like our own fiestas, these festivals celebrate a religious icon or event and are endemic to a specific place. Fukuoka’s big festival is the Hakata Gion Yamakasa. Its beginnings is said to have been in 1241, when a plague had besieged the town. 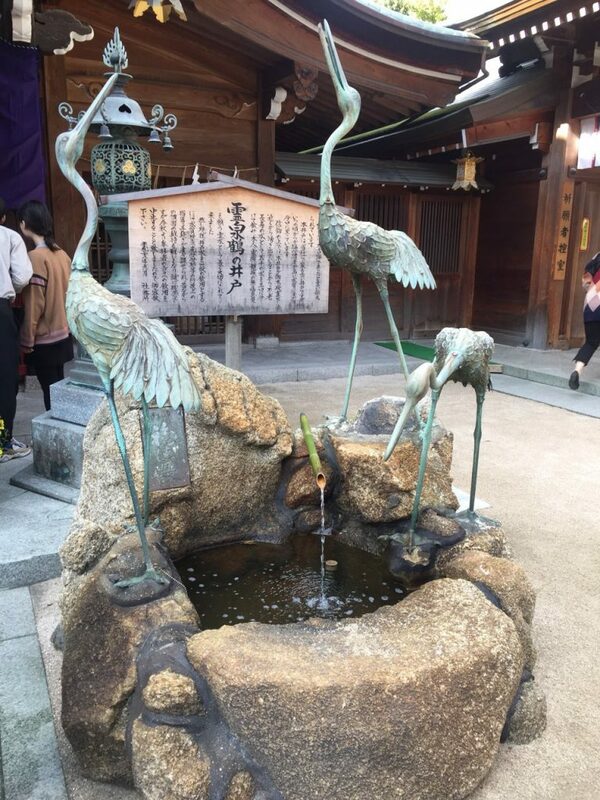 After much prayer, the head monk of the Kushida shrine sprinkled holy water around the town, curing the town of the plague. In celebration of that, the festival was started, and each year, on July 1, people carry heavy floats called Yamakasa around the city. 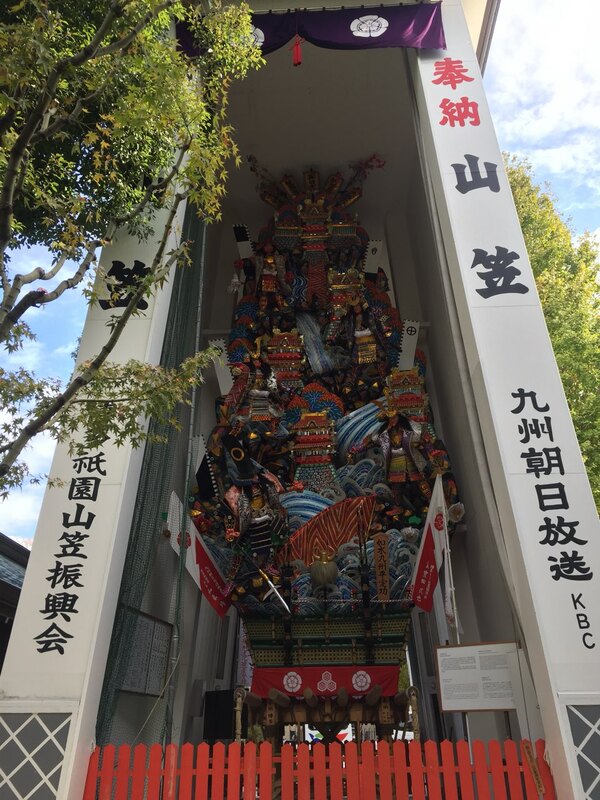 Off-season, the Yamakasas are housed inside the Kushida shrine. We also visited this hole-in-the-wall ramen shop. Fukuoka is pretty well known for its ramen. In fact, its Hakata ward is famed as one of the Big Three of ramen, along with Sapporo and either Tokyo or Kitakata. Just like how Sapporo is inextricably tied to miso, in the Japanese noodle world, Hakata is synonymous with tonkotsu, the pork bone ramen with creamy white broth. By the way, unlike ramen here, Hakata ramen is pretty cheap. We got the most expensive bowl, and it only set us back by 450 yen (208 pesos). Nagasaki is a city dressed in history. Because it was a natural harbor flanked by mountains on all sides, the city was a popular port in the olden times. 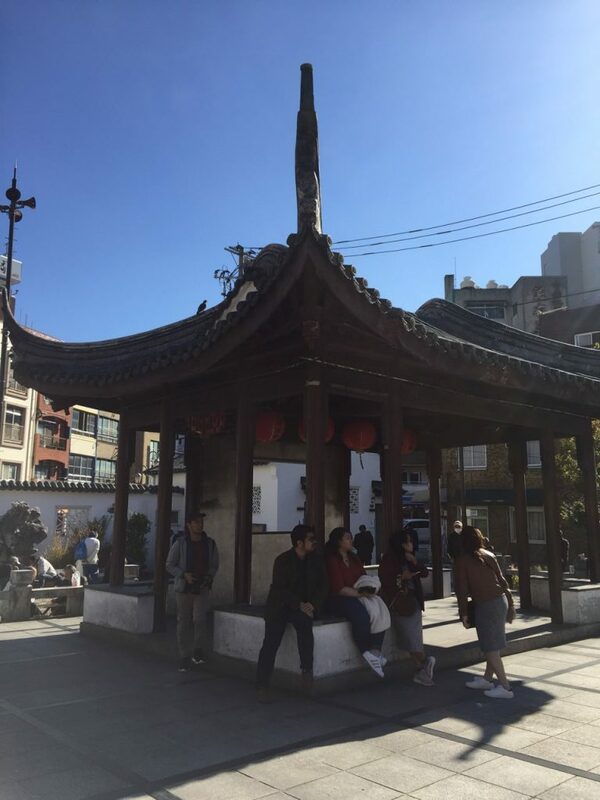 While in Fukuoka being a port meant that it saw through many Japanese battles, Nagasaki was one of the few Japanese ports open to foreigners, so it became a point of contact with many other cultures. Walking around Nagasaki, you’ll notice many Christian churches. Many missionaries were sent here and quickly gained converts, and because of Christianity’s quick growth, the Emperor grew scared of the apparent Western invasion, and many Christians were persecuted. This was the place where Lorenzo Ruiz was tortured; on the hill where he died now stands a monument dedicated to him and his fellow martyrs. This is to say that the history of Nagasaki isn’t all that pretty. We need this preface because for anyone to talk about Nagasaki, one will have to talk about the atomic bomb. In the ninth of August, 1945, near the end of World War 2, the U.S. army dropped a bomb made of plutonium over the city. This was, the US army reasoned, a final effort to end the war. However, later records would show that they were aware that the Japanese forces were going to surrender soon after anyways. In any case, the city was destroyed. 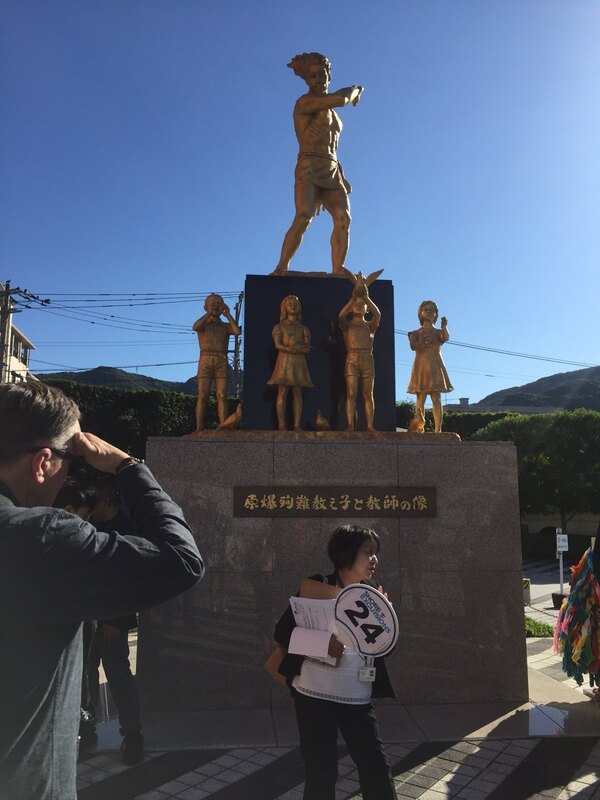 One third of the population was killed by the bomb, our Nagasaki guide, Eriko, told us. 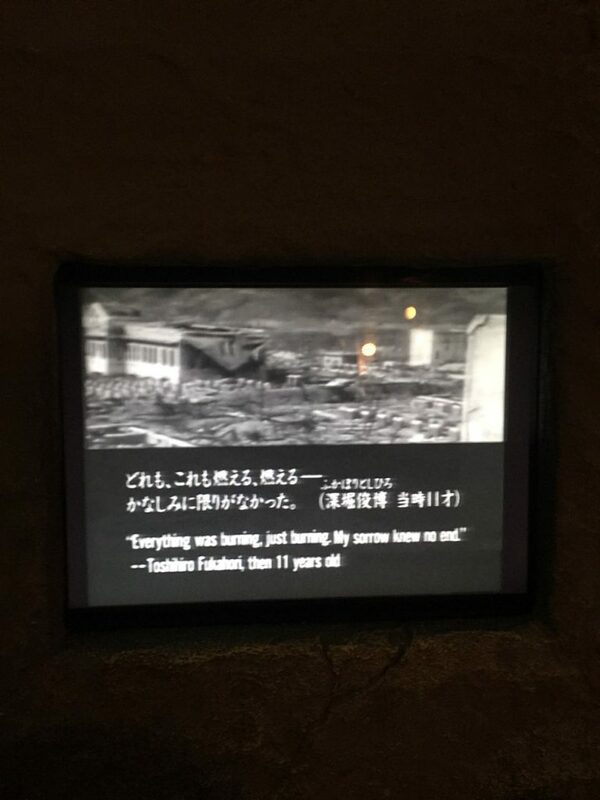 We visited the Atomic Bomb Museum, a museum honoring the memory of the Nagasaki victims located right where the bomb had been dropped. 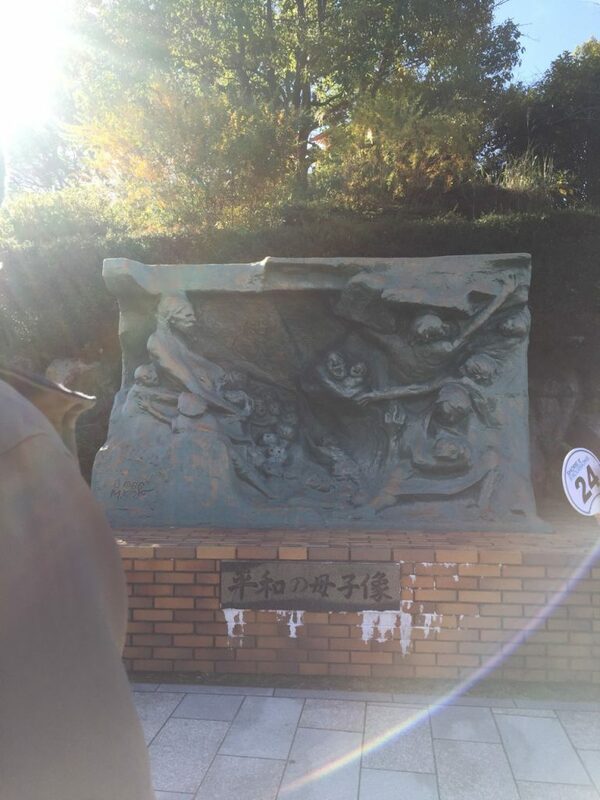 Right at the entrance of the museum is a monument devoted to the students and teachers that had been killed by the explosion. Visiting the ground zero of the explosion was incredibly chilling. On the museum grounds was a lake that had been contaminated with plutonium; when the bomb hit, it was filled with the bodies of people seeking for water to end the fire that was burning them alive, but the contaminated water only worsened it. We also saw a monument depicting women and children hiding at the bomb shelter: our guide told us that, because an infant’s cry would alert enemy soldiers of their whereabouts, many mothers were forced to kill their own babies. The museum exhibit itself was also pretty somber. What we gravitated to were the screens showing the actual reality of the bombing, as well as the works of art created by the survivors that were displayed around the museum. “Everything was burning, just burning. My sorrow knew no end,” the screen flashed, a quote from a then-11 year old boy. 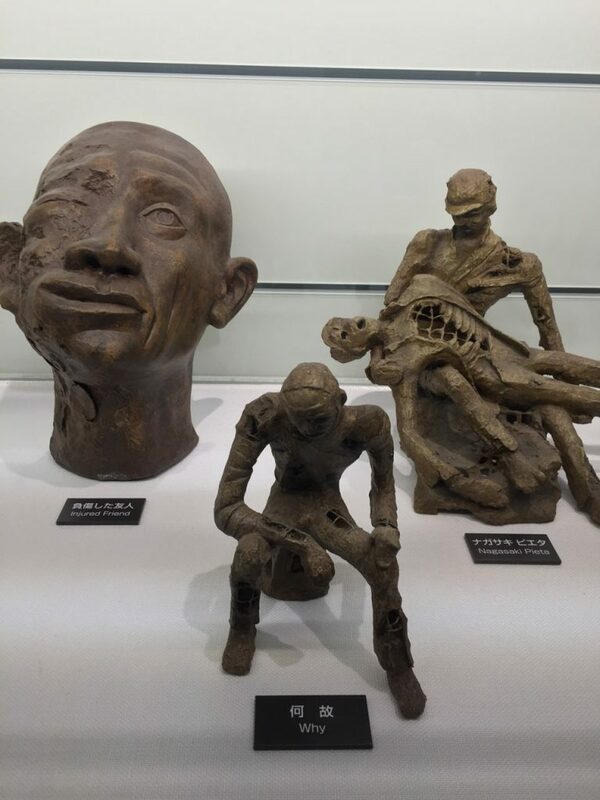 It sounds really depressing, but this is why you need to visit Nagasaki’s museum. 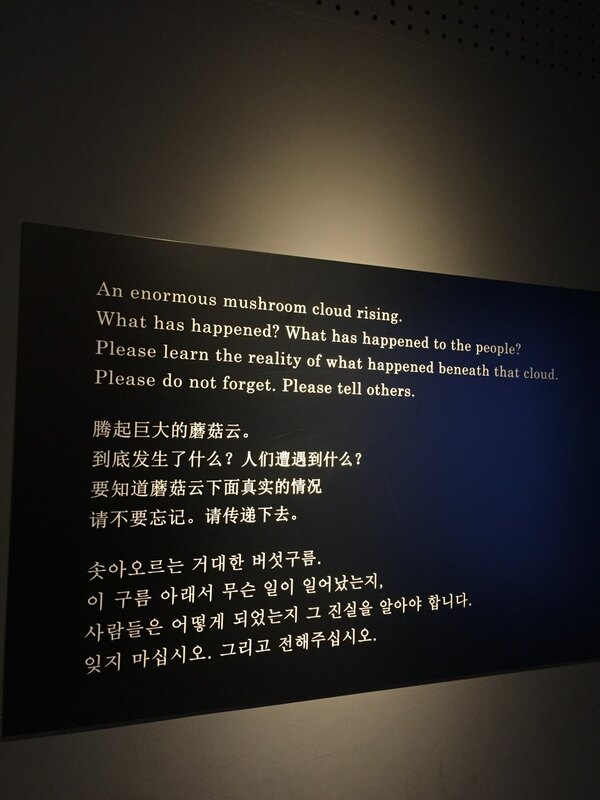 This sign near the entrance of the exhibit pleads for people to learn the reality of the bombing, and to never forget. The horrors of war is something that we all need to open our eyes to. In 2014, the Institute for Economics and Peace reported that only 11 of the world’s 168 countries were free from conflict, and it’s mind-boggling that we call this age the modern, civilized era, and yet so much armed conflict and war is still taking place. What we need to do is actually start learning from all these wars and start building towards peace. On that note, we visited Nagasaki’s Peace Park soon after. Erected at the center of the park is a huge statue that symbolizes both the dangers of war, and hope for peace. 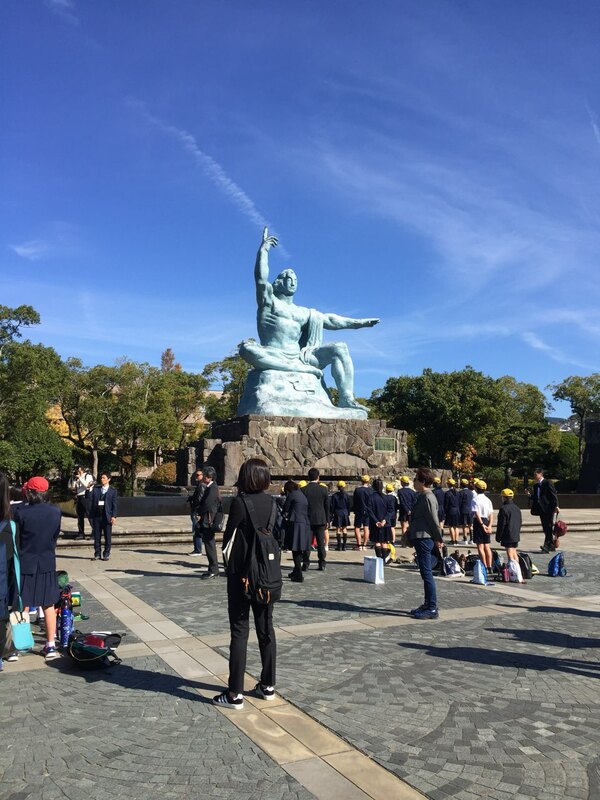 The statue’s right arm is raised to the sky, pointing to an atomic bomb that may still fall, while the left arm is stretched out horizontally, a sign for peace. Its eyes are closed in honor of all the people that died in the war. It’s a hopeful image, but also a cautious one. Lest you think that Nagasaki is only about the war though, there are other must-sees of the city. 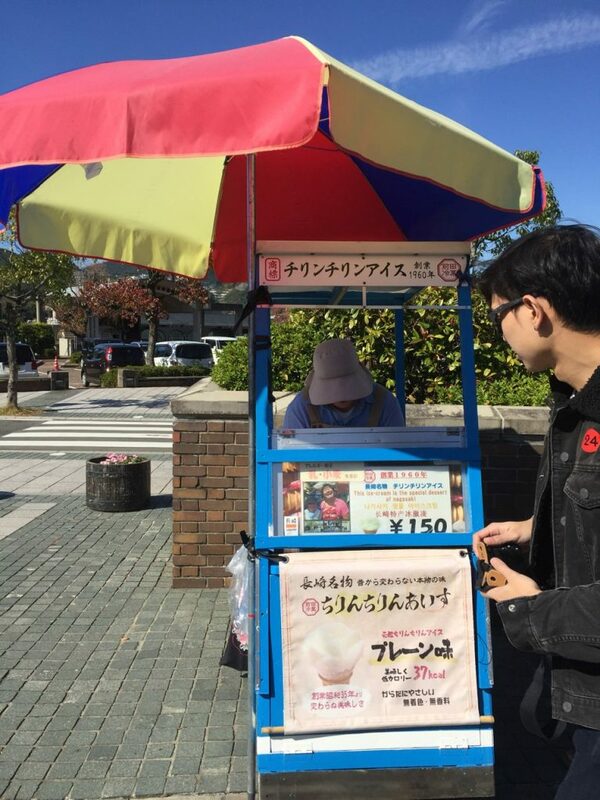 At the Peace Park, you can find a stall selling chirin-chirin, a Nagasaki delicacy. 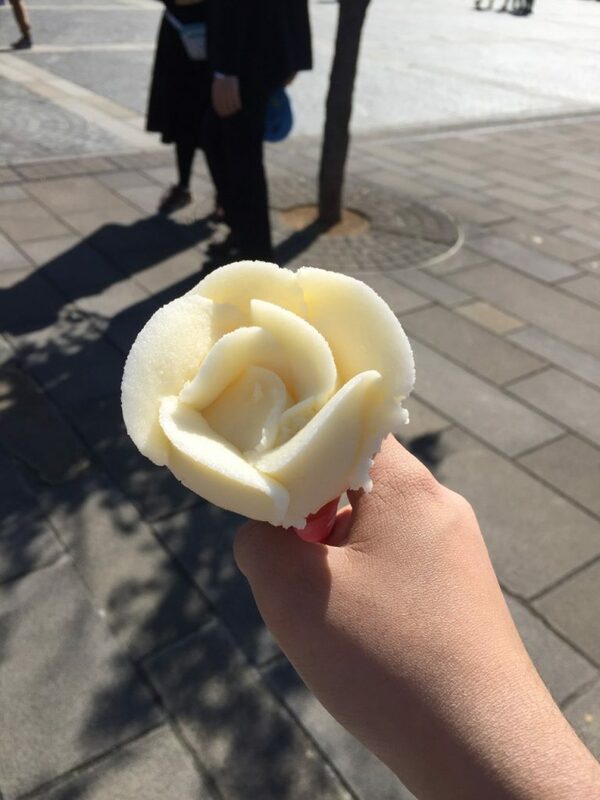 It’s vanilla ice cream (though its consistency is closer to shaved ice), and sellers scoop it into the shape of a rose. Not bad for 150 yen (70 pesos). Remember how we mentioned that Nagasaki was a foreign port? This meant that many Chinese nationals also went to Nagasaki for trade, and many of them ended up staying, much like the Chinese sangleys of Philippine history. Because of this, Nagasaki is home to Shinchi Chinatown, Japan’s oldest Chinatown (the other two are in Yokohama and Kobe). Established in the 17th century, Shinchi Chinatown has all the hallmarks of a proper Chinatown: the large Chinese structures serving as gates, the Chinese storefronts in red and orange selling miscellaneous wares, narrow streets punctuated with open carts selling pancit and dimsum. Think Binondo, but cleaner. Being ports, both Nagasaki and Fukuoka are pretty accessible. You can ride a ship to here like we did, or you can take a plane ride (both places have their own airports). If you’re coming from Tokyo, there’s a shinkansen train that runs from Tokyo to Fukuoka, though there isn’t one for Nagasaki. For there, you can take the separate train that goes from Fukuoka to Nagasaki instead. The train will cost you at least 20,000 yen (roughly 9,200 pesos) for the Tokyo to Fukuoka ride alone. By far, the most expensive things that you’ll have to shell out for will be the fare and accommodations. Prices are cheaper in the province compared to the metropolitan areas; for example, one us had 20,000 yen in hand for our two-day Japan excursion and still had a lot left over by the end of the trip. Most sights are either free, or will only charge a small entrance fee. The food is also pretty cheap (see: ramen). Add this to why you should choose to visit the Japanese countryside. Think you know exactly what’s in Bhutan?